Yesterday, while in a waiting room, I had the chance to page through a magazine I've never read before: Birds & Blooms, all about, of course, birds and flowers. This particular issue focused on one of earth's most magical creatures-- hummingbirds. Plus, it was the only magazine in the waiting area, so I opened it up. One day, the author noticed a tiny hummingbird nest on a tree in their yard in Arizona. The eggs must have been miniscule. A few days later, however, the nest and its two eggs were on ground. The mother hummingbird frantically flew around the fallen nest, clearly distraught. One of the baby birds didn't make it. The other egg, however, was still intact. The author somehow thought to use Elmer's glue to help restore and secure the tiny nest to its tree branch. The mother hummingbird went right back to guarding her single egg. She didn't abandon it. The mother and her nest were soon in for another challenge as a hailstorm was fast approaching. The author stood out in the hail to protect the nest using an umbrella. Eventually, the wind was too much for the umbrella and it snapped. For rest of the storm, the author used her hands to shield the nest. Miraculously, the egg and nest remained intact after the storm. When the bee-sized baby bird emerged from its fragile egg, it appeared the mother and baby hummingbird knew how much this human had helped them. 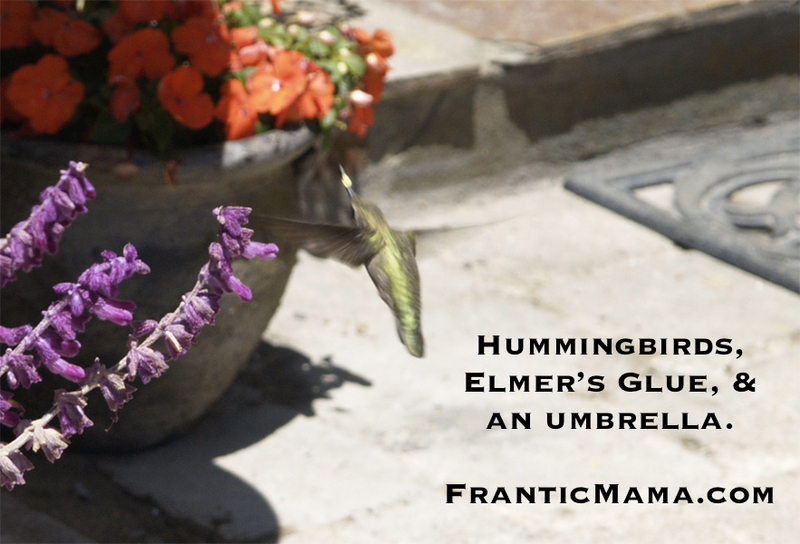 Hummingbirds are notoriously skittish, but these two happily buzz about the author and her husband. The baby has even perched on the author's shoulder. I find this story remarkable for so many reasons. I love witnessing that fierce, instinctual mother-child protection. In this story, we see two versions of it-- with the mother hummingbird, and with the human. I love that in a world so often filled with cruelty and sadness, one where everyone always laments how "busy" they are, someone devoted so much time and care to help one of earth's tiniest creatures. And I love a happy ending. I might have to agree with you on that. I often feel that way when a butterfly visits for a bit :).